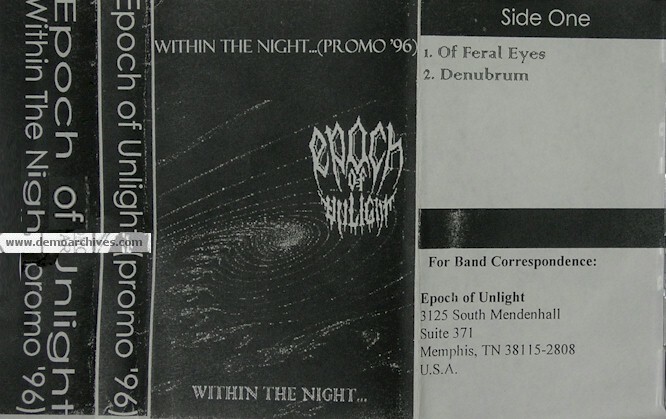 The band started as Enraptured chaning to Requiem then finally in 1994 they officially decided upon EPOCH OF UNLIGHT. 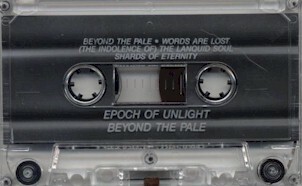 It was this later this year that their first demo, Beyond the Pale, was released as a 4 song cassette. In 1995 they recorded their second demo, 'Within The Night' as a 3-song MCD, and in May of 1997 they returned to the studio to record three new tracks. The new songs have been released as a promo CD entitled 'Black & Crimson Glory. This promo captured the attention of many labels and in the winter of 1998, EPOCH OF UNLIGHT signed with THE END RECORDS. Shortly thereafter the band entered the studio to record their debut full-length album. Entitled 'What Will Be Has Been', the album was described as a mix of melodic death/black metal. 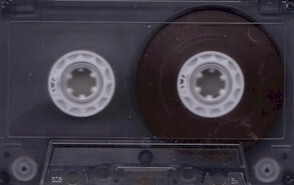 Only demo released as Cassette. Pro printed covers and cassettes. Lyrics were on the back. Xeroxed covers and regular tapes..
Xeroxed covers and regular tapes. Tracks 1-3 from 1995 Within The Night Adv. CD, Tracks 4-10 are from a 1996 Rehearsal and the rest are Live from 1995.